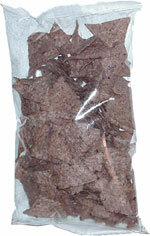 Taste test: These triangular tortilla chips have a light reddish brown hue. They're fairly crisp, and slightly tasty, if you get one that has a decent amount of salt on it. The ones without salt have barely any taste at all. These should be OK for light dipping. From the package: Nothing. It's just a blank, clear bag.